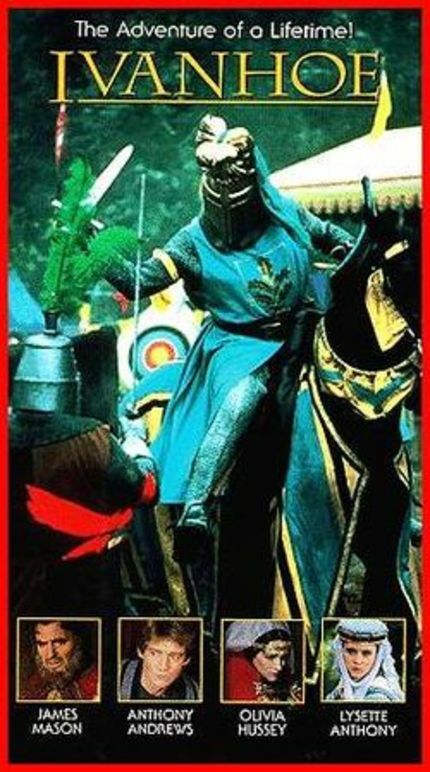 Classic Movie Review: Ivanhoe, a British Television Movie from 1982! One of the most legendary writers of all time created the most adventurous fantasized and romanticized novel of all time Ivanhoe. Later in the timeline of movie making, several movies of this story were made, including an Australian cartoon movie from 1986. In 1982, a British movie maker Douglas Camfield created a television movie together with the writer John Gay. Douglas was born in 8th May in India, got adopted by English parents in London, he sadly passed away the 24th January 1984. His Ivanhoe movie is claimed to be one of the best version of the story and in Sweden when it got released it became so popular that it is broadcast on tv even today as a new year tradition every 31 December. After returning home from the war in the holy land. Ivanhoe (Anthony Andrews) saves a Jewish salesman Isaac of York (James Mason) from an ambush by the Normands. Grateful by his actions, Isaac offers Ivanhoe strong equipment and a fast horse for the tournament. Ivanhoe sees the tournament as chance to be forgiven by his father Cedric the Saxon (Michael Horden) and to reclaim his love for the Lady Rowina (Lysette Anthony). But the victory doesn't go as planned, when Ivanhoe get seriously injured by the ruthless Normand Templar Knight Brian Gilbert (Sam Niell). Gilbert is almost successful to kill Ivanhoe but get interrupted by a mysterious Black Knight who rescue Ivanhoe. Rebecca (Olivia Hussey) is the daughter of Isaac offers Ivanhoe protection and medical help. But she and her father get captured together with Ivanhoe, Cedric, and Rowina by the Normand leader Front De Beuf (John Rhys-Davies). Prince John (Ronald Pickup) order De Beuf to find the Black Knight and eliminate him, but what he doesn't know is the Black Knight is England's rightful King Richard the 1st (Julian Glover). In the novel, the book describe more of the war in the holy land and tells Ivanhoes experience in the war with King Richard, in the movie, it's not shown at all, it's not even mentioned until later in the movie, it's starts with Ivanhoe dressed as a Pilgrim and rescue Isaac. Brian Gilbert was named De Bois Gilbert, and was more brutal to Rebecca, but in the movie Brian Gilbert has love affection for Rebecca, despite he kidnap her, he get more sensitive and sympathy for her. the Character Maurice De Bracy is the third leader of the Normands in the movie, and a 2nd rival to Lady Rowinas affection, it in the novel he wasn't one the leaders, he was only a mere soldier, in the novel only Front De Beuf and De Bois Gilbert were the leaders, although one part was correct in the movie, and that is when he surrendered to King Richard, and the king let him go to send a message to Prince John. Robin Hood guest appeared in both the novel and the movie. Despite its a television production, Ivanhoe from 1982 is very strong as any cinema movie. And has the best actors to perform as Robin Hood (David Robb) and Friar Tuck (Tony Haygarth), the casting is all well portrayed for their parts, and the director Douglas Camfield did an excellent job with the cinematography, specially the tournament scenes. I with pleasure reward this great British movie with 8/10.